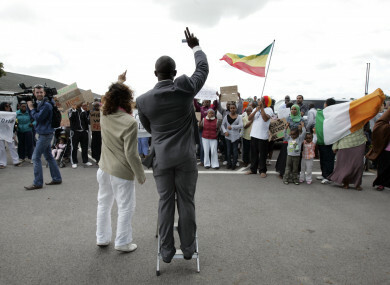 Asylum seekers protest at Mosney, Co Meath in 2010. A SURGE IN the numbers of asylum seekers living in Direct Provision centres sent the fees paid to private firms operating the network of centres across the country soaring to €72 million, including Vat, last year. In 2018, the numbers of people being accommodated in direct provision increased by 18% from 5,096 at the start of the year to 5,997 at the end of December. The sharp increase in numbers has resulted in an increase in revenue for the private firms operating the centres, with new figures published by the Department of Justice showing that six firms received payments in excess of €5 million last year including two receiving payments in excess of €7 million. The figures show that the contractor to receive the highest amount from the Department of Justice was Mosney Holidays plc which received fees of €8.69m. Mosney Holidays plc operates a direct provision centre for 600 asylum seekers at Mosney in Co Meath and the €8.6m it received last year brings to €136m the company has received from the State between 2002 and 2018 for its Direct Provision service. The increased numbers of people seeking asylum here has had Department of Justice officials scrambling to identify new Direct Provision centres. Last year, a move by the Department of Justice to set up a new centre for 115 asylum seekers in the north Clare village of Lisdoonvarna led to tensions in the local community after a local hotelier, Marcus White made his King Thomond hotel available. Now, the new figures show that White’s James White & Co Ltd received fees of €1.24m for 2018. Much attention was also given to the arrival of a group of Syrian refugees at the Abbeyfield Hotel at Ballaghaderreen in Co Roscommon in December last year. The figures show that the owner of the hotel, Next Week & Co Ltd received payments of €3.16m in 2018. The reception centre at Ballaghaderreen. Along with Mosney Holidays Plc, one other business received payments in excess of €7m – last year, Alan Hyde’s Barlow Group last year received fees of €7.5m and the group accommodates asylum seekers across Cork and Waterford. Millstreet Equestrian Services which provides accommodation for over 500 asylum seekers in Cork and Waterford received payments of €6.53 million. Between 2000 and 2018, Millstreet Equestrian Services has received €82.5 million in fees from the State. Aramark’s Campbell Catering Ltd last year received €5.89m for operating State owned direct provision centres at Knockalisheen, Co Clare, Co Cork and Co Meath where over 825 asylum seekers are accommodated. Bridgestock caters for around 500 asylum seekers in Ballyhaunis, Co Mayo and Sligo town and the €5.8m received last year brings to €97m the firm has received in payments between 2000 and 2018. The firm which operates the largest direct provision centre in the capital, Clondalkin Towers Hotel, Fazyard Ltd last year received €5.5 million. East Coast Catering Ltd which accommodates around 600 asylum seekers in Dublin and Louth last year received €4.4m. Maplestar Ltd accommodates 200 asylum seekers at the Eglinton Hotel at Salthill, Co Galway and received €3m in payments. The figures also show that Onsite Field Management received fees of €2.8 million to provide services for 335 asylum seekers at four centres in Co Kerry. Sidetracks Ltd, which accommodates 162 asylum seekers at a Great Western Hotel in Galway last year received €2m in fees while another firm, Tattonward Ltd which accommodates 175 asylum seekers at Drumgoask, Monaghan received €2.1m. Email “Payments to private Direct Provision firms rise to €72m after 18% increase in asylum seekers”. Feedback on “Payments to private Direct Provision firms rise to €72m after 18% increase in asylum seekers”.